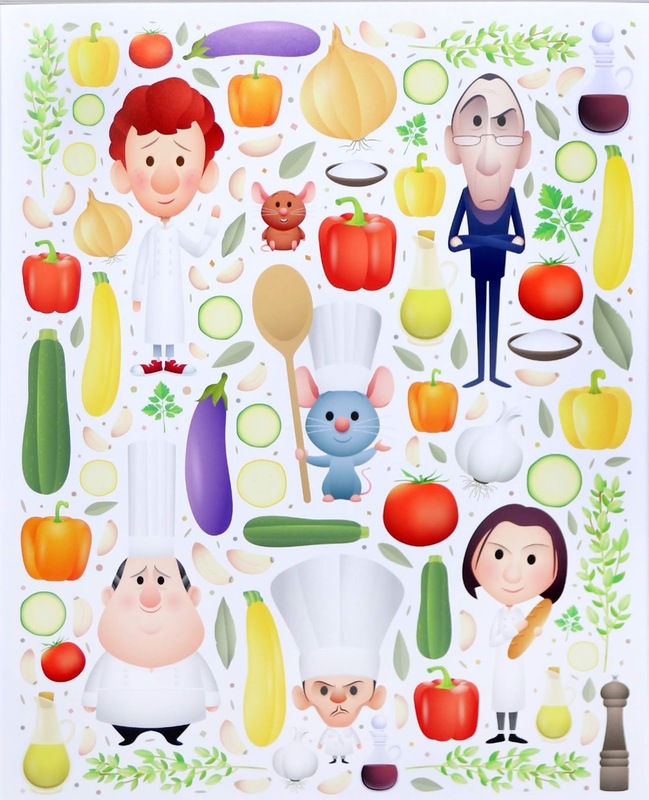 Dan the Pixar Fan: Ratatouille: "Remy's Recipe" (Art by Jerrod Maruyama)—Deluxe Print! 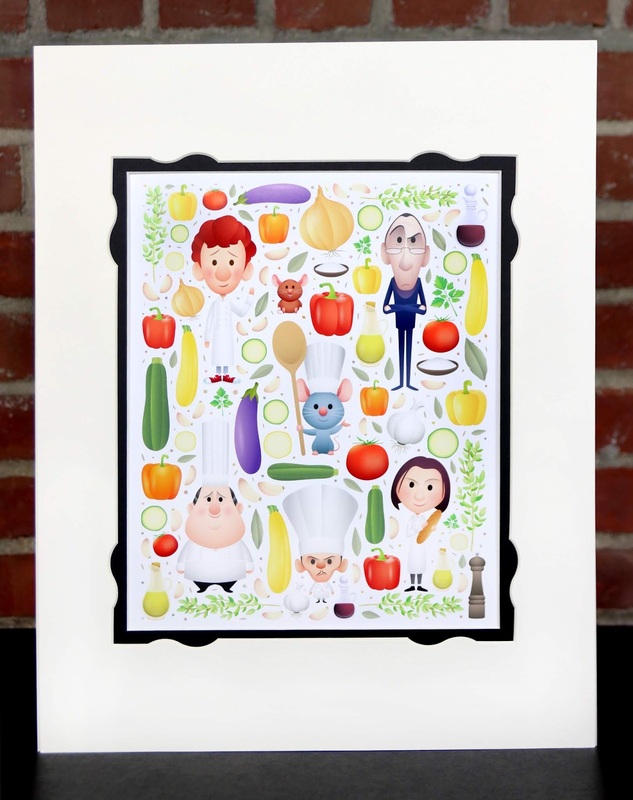 Ratatouille: "Remy's Recipe" (Art by Jerrod Maruyama)—Deluxe Print! One of my favorite Disney freelance artists, my friend Jerrod Maruyama, has been on a roll lately creating new and marvelous Pixar inspired artwork in his signature cute style. At the end of 2016, Jerrod created his epic "World of Pixar" piece—which pretty much marked the first in this string of Pixar related Disney Parks prints. That one was then followed by a Cars Land print last summer, an Up print released this past February and now his latest effort based on one of my personal fave Pixar films, Ratatouille! This print, adorably entitled "Remy's Recipe", premiered on March 24th at the Disney California Adventure 2018 Food and Wine Festival. According to a recent contact of mine, this print is still available to purchase at Disneyland's Downtown Disney Wonderground Gallery (though that was a couple weeks back). As usual, this is the 14"x18" Deluxe size matted print ($39.99), but there is also a small 5"x7" postcard size version ($4.95) if you don't have the wall space or 40 bucks to spend. If you're not able to make it to Disneyland anytime soon, keep in mind that art like this usually makes its way to the ShopDisneyParks app and/or the ShopDisney website at one point or another (though it's not yet available through any of those means). Lastly, you can always call the Disney Parks Merchandise Guest Services/Mail Order Hotline at 877-560-6477 and see if they can have it sent to you. Oh yah, and eBay is always an option as well (but it gets a bit pricey on there). Let me zoom in for a closer look at the art itself! Just WOW. All your favorite characters are here: Chef Remy, Colette. Linguini, Chef Gusteau, Chef Skinner, Anton Ego and even Remy's brother Emile—all surrounded by beautiful, colorful, fresh looking vegetables, herbs and spices. I just love how everyone's personality is perfectly captured here, mostly through the facial expressions. One of my favorite details is how Colette is holding the loaf of bread, just like she does in the film when she teaches Linguini to listen to the sounds of the crust. I can hear it now. Honestly, I think we have another masterpiece here! Note: I was able to pick up a simple black 14"x18" frame at Michael's craft store and it works perfectly (will show off my final framing/mounting job here soon). The size of the print without the matte is 11 2/5'' H x 9'' W. I'm so excited to hang this alongside my other pieces in my home office Jerrod Maruyama wall gallery! 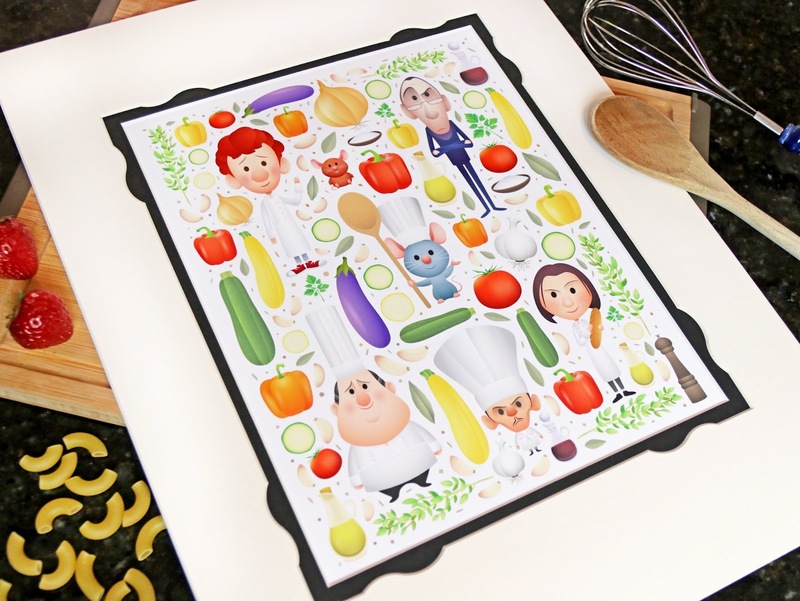 If you love Ratatouille, you will certainly love this print and I can't recommend it enough. This is sure to become a popular piece of kitchen wall art in many Disney fans' households. Pick it up soon while it's still available and be sure to let me know your thoughts/any questions you might have in the comments below! 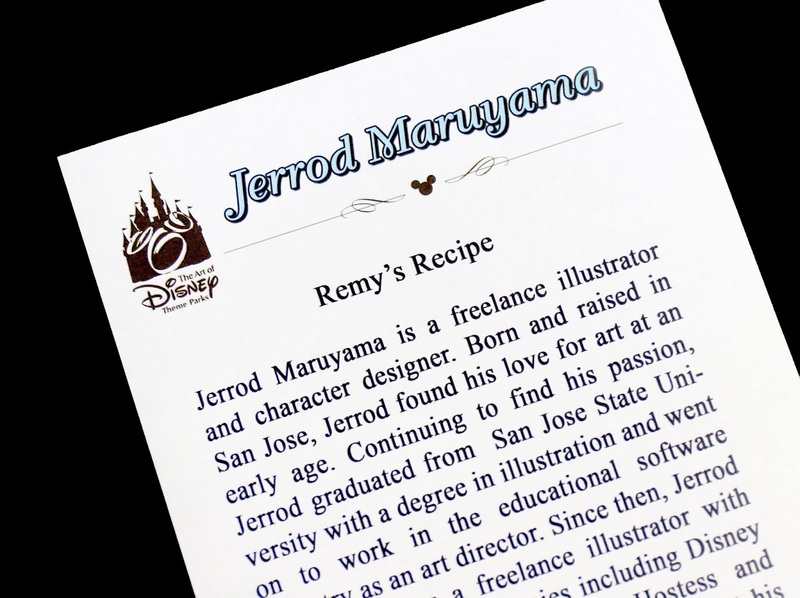 You can also reach out to Jerrod directly through his blog HERE or any of his social media platforms (Facebook, Instagram, Tumblr, Flickr & Dribbble). I wonder what Jerrod will do next in terms of Pixar? Time will tell, but you can guarantee I'll be adding it to my collection and reviewing it right here whenever it's released. Stay tuned.